This fact sheet provides management tips to enable farmers to properly locate, make, and manage a silage pile for short-term silage storage. Farmers have been making silage pile for years, but some methods have allowed huge storage losses. Typically, a pile is constructed by unloading silage into an elevator and piling up the silage, much as a quarry piles sand or gravel. This piling method misses the most important step – PACKING. Silage exposed to oxygen deteriorates rapidly. Packing forces air and oxygen from the silage. Excluding oxygen is essential to produce good fermentation and well preserved silage. Without proper packing, spoilage can exceed 30 percent of the ensiled dry matter. To ensure proper packing, you will need a large-wheel tractor. This level of spoilage is unacceptable and unnecessary. 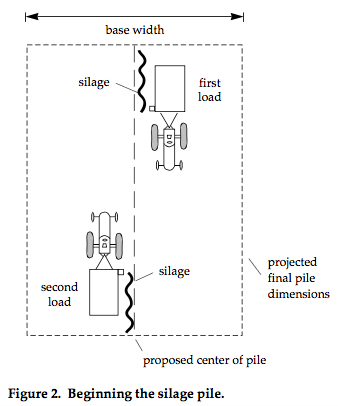 The following step-by-step technique produces an inexpensive and efficient short-term storage option that can limit dry matter losses to 15 to 25 percent. Select an elevated location that allows rain and snow melt to drain away from, rather than toward the pile. Don’t locate the pile in a low area that may become inaccessible due to mud or ponded water. Locate the pile away from existing wells to minimize contamination danger from seepage. The pile should be at least 100 feet away and downslope from the well. This distance may increase on more permeable soils (sand, for example), or with shallow well depth. Consider snow drift patterns at the selected site. Don’t locate a pile where snow drift might restrict access. Locate the pile as close to the feeding system or bunk as possible. Consider how you will move the silage to the cattle, and what feedback or feeding system modifications or additions you’ll need. While a fidget or electric-wire may be used to feed off the pile, we don’t recommend self-feeding directly from the pile due to excessive feeding losses. Refilling a tower silo from a pile is an option for feeding systems that are not equipped to handle silage from a pile. For quickest refilling, site the pile so that you can efficiently move the silage to the tower silo. Refill the silo when the weather is cool and fill as rapidly as possible. Don’t underestimate the space necessary to move equipment on and around the silage pile. If you ignore space requirements before construction, you may find it impossible to properly build and compact the pile. Fence livestock away from the silage pile. Animals can damage the plastic cover, exposing the silage to air and causing spoilage. Rodents, squirrels, and other small animals will gnaw holes in the plastic to seek food and shelter. Locate a silage pile away from woods, trash piles and other possible shelters. Keep weeds and grass cut around the pile to reduce damage from wild animals. Inspect the plastic cover frequently, and immediately repair any holes or cuts to minimize spoilage losses. Equipment traffic needed to feed out the pile is high. This equipment often causes ruts and mud holes on unprepared sites. An improved surface will allow all-weather access to the pile. Rain and silage seepage can make pile access difficult on unimproved ground. If you wait until the ground is frozen before feeding from the pile, remember that the ground under the pile will not freeze and may become a problem. If possible, build a pile on an existing concrete slab. The next best alternative is to construct a macadam surface (see Extension Bulletin A3405, Macadam All-Weather Surfaces for Livestock Yards, Building Floors and Driveways). 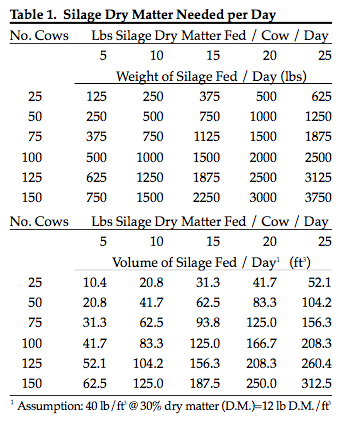 Determine the number of pounds of silage that will be fed from the pile each day. For example, assume 3,000 lbs. Divide the weight fed by 40 lbs/ft3. In our example, 3,000 lbs divided by 40 lbs/ft3 = 75 ft3. This is the volume of silage removed from the pile each day. Establish a daily removal rate from the face of the pile. Use 6 inches (0.5 ft) for our example. Assume an average pile depth. The actual peak height will be more than the average depth due to pile rounding. For our example, we will use 5 ft. So for our example, the pile will have an average height of 5 feet and an average width of 30 feet. These are reasonable values, but if your calculations produce an average width that is unrealistically narrow, assume a shorter average depth and return to Step 6. If this is still unrealistic, assume a smaller face removal rate (not less than 3 inches) and return to Step 4. The base of the pile will be wider than the average pile width. (This is due to final pile grading, which will be discussed in more detail later in this publication.) 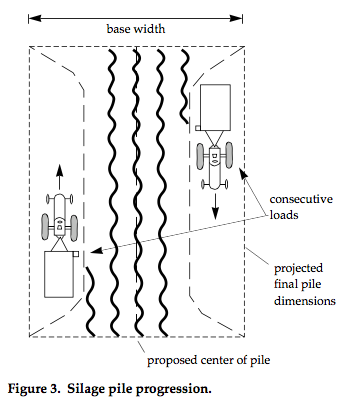 The pile should be at least 12 to 15 feet wide at the top to allow proper packing and reduce rollover potential. The maximum pile height should be 6 to 8 feet to prevent sides from becoming too steep. See Figure 1. The tractor and wagon that deliver silage to the pile will also do most of the packing. Start at the center of the projected pile, with the tractor in low gear and the wagon unloading speed set on high. 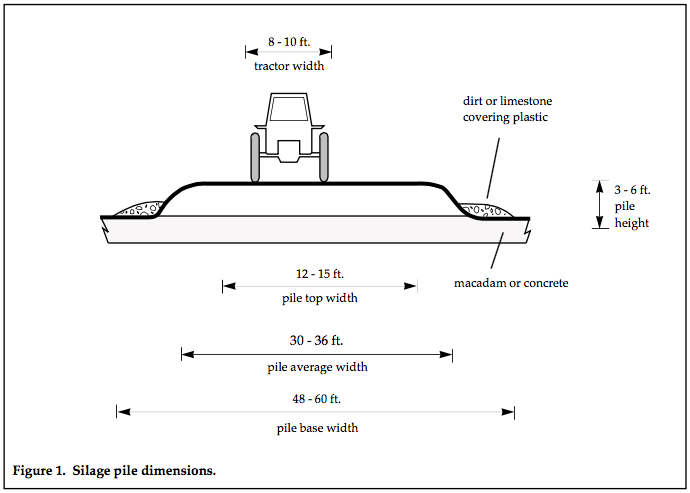 Unload the silage in a straight line (see Figure 2) until the chopper box is empty or you reach the desired pile length. The next load will be unloaded again from the center but in the opposite direction. Continue to unload alternative passes (see Figure 3) in this manner until you obtain the desired width (see Figure 1). Once you’ve reached the desired width, start from the middle of the pile again by driving over the silage that was unloaded in the first loads. Pulling the loads over the piled silage packs the pile as it is being built. As you add more layers to the pile, you may need a larger tractor or a four-wheel-drive tractor to pull the full wagon onto and over the pile. Be careful when unloading near the sides of the pile to prevent the tractor and chopper box from tipping over. Unloading toward the outside of the pile may help avoid risk of tipping the chopper box. You’ll need a large-wheel tractor for the final packing. A heavy four-wheel-drive, without dual wheels, is best. The packing tractor should have rollover protection and the operator should use a seat belt. The standard rule is that you cannot over-pack the pile. After all of the silage has been unloaded, slope the sides and crown the top of the pile and pack for the final time. The final pack should be done across the pile and then end to end. Be careful not to tip the packing tractor. Immediately cover the pile with 6 mil black plastic when the final pack is completed. The plastic should be pulled tight and sealed along the sides by piling dirt or limestone along the edge. When held tightly against the pile, the plastic eliminates air spaces and reduces spoilage. 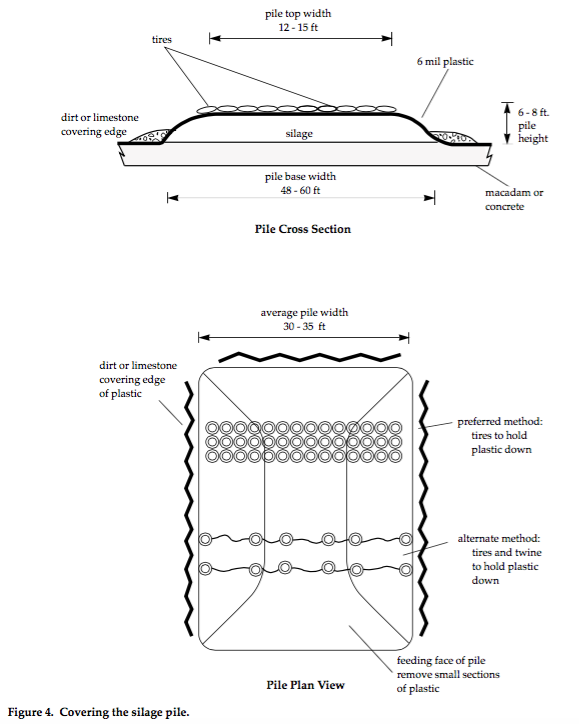 Use tires to hold the plastic down on top of the pile as well (see Figure 4). Position the tires so that they touch one another. This seals the plastic to the silage and minimizes air spaces. Cutting the tires in half along the circumference has several advantages. You’ll need half as many tires, they are lighter to handle, and rain water drains more easily from the tires. Dave Geister Sr. has developed an easy method of cutting tires along the circumference. Contact Dave at Dave’s Service, P.O. Box 274, Prescott WI 54021 (715) 262-5673. If you use uncut tires, drill holes in them to allow rain water to drain – otherwise you could end up with a mosquito hotel on your silage pile. You can also tie string or twine between the tires and use fewer tires. The string, weighted by the tires, holds the plastic in place (see Figure 4). However, we recommend the tires-only method, because the tires hold the plastic tightly against the silage. 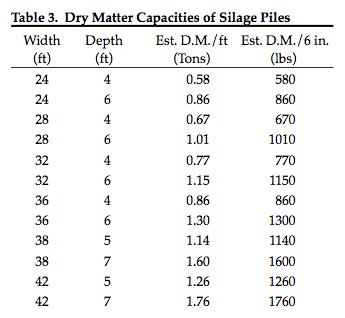 To increase packing effectiveness, forage for silage piles should be slightly wetter than forage going into upright silos. 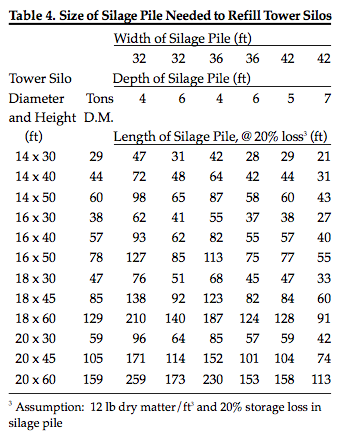 Forage for concrete stave upright silos typically contains 55 to 65 percent moisture (35 to 45 percent dry matter). Corn silage reaches this moisture level when the milk line is between one-fourth and one-half. For other forages, reduce the field drying time by about one-half day. For smaller piles, 65 to 72 percent moisture (28 to 35 percent dry matter) may help packing and sealing. 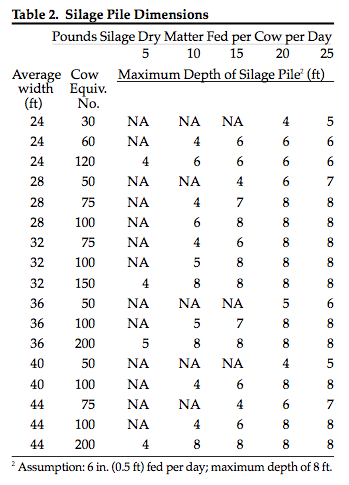 Try for the wetter range in the top layer of silage. Properly constructed, a drive-over silage pile can provide efficient and economical short-term silage storage. Unpacked piles made by simply blowing or elevating the silage into piles suffer large spoilage losses and are not economical storage alternatives. Beef Housing and Equipment Handbook, MWPS #6. Midwest Plan Service. Iowa State University, Ames, IA 50011. Authors: John M. Roach is dairy/livestock agent for Outagamie County, University of Wisconsin-Extension, Cooperative Extension. David W. Kammel is assistant professor and farm structures specialist, Department of Agricultural Engineering, College of Agricultural and Life Sciences, University of Wisconsin-Madison and University of Wisconsin-Extension, Cooperative Extension. This publication is available from your Wisconsin county Extension office or from: Agricultural Bulletin, Rm. 245, 30 N. Murray St., Madison, Wisconsin 53715, Phone 608-262-3346. Contact Agricultural Bulletin to determine availability before publicizing. University of Wisconsin-Extension, Cooperative Extension, in cooperation with the U.S. Department of Agriculture and Wisconsin counties, published this information to further the purpose of the May 8 and June 30, 1914 Acts of Congress; and provides equal opportunities in employment and programming including Title IX requirements.